Being seasoned rubbertramps, the drive back south from the Anchorage area was victory lap-esque. 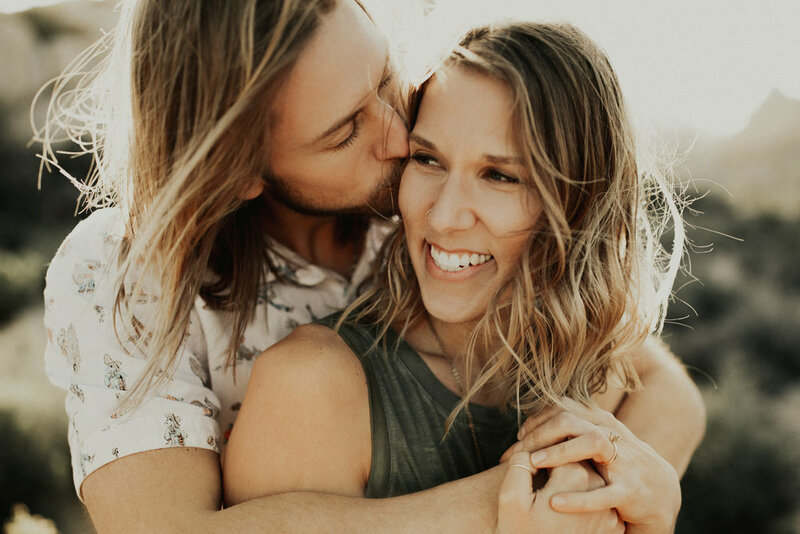 While the 40+ hour drive loomed over us, we knew what to expect. This made the trek a little less ominous. This time we knew what stretches of the road we could expect to find gas stations (and liquor stores) and where we would be sleeping, for the most part. Also, in preparation of boredom, we downloaded as many podcasts as we could and even had a book we could read aloud. We were prepared. We drove all day into the night, taking turns reading A Walk In the Woods aloud and stopping in roughly the same areas to sleep. One of the only towns in the Yukon with a population greater than 20 was Watson Lake. 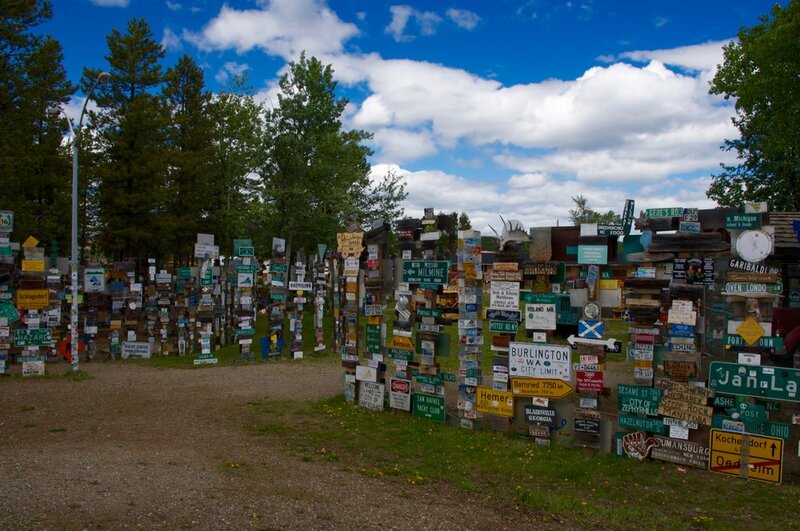 We passed through this town on our initial drive, however we did not stop at it’s most famous attraction: The Sign Post Forest. 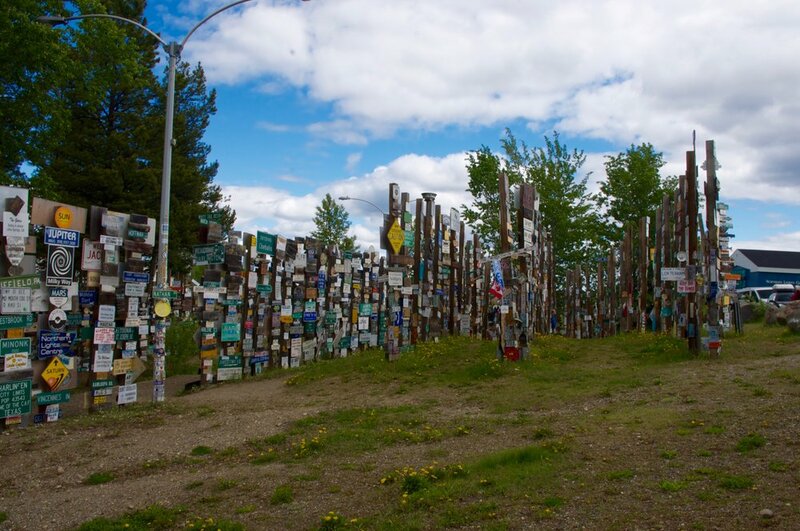 This “forest” is a collection of over 73,000 license plates, street signs and other signs left by passersby on their way along the Alaska HIghway. It was awesome walking through and seeing all of the signs from Texas, Michigan, Germany, you name it. 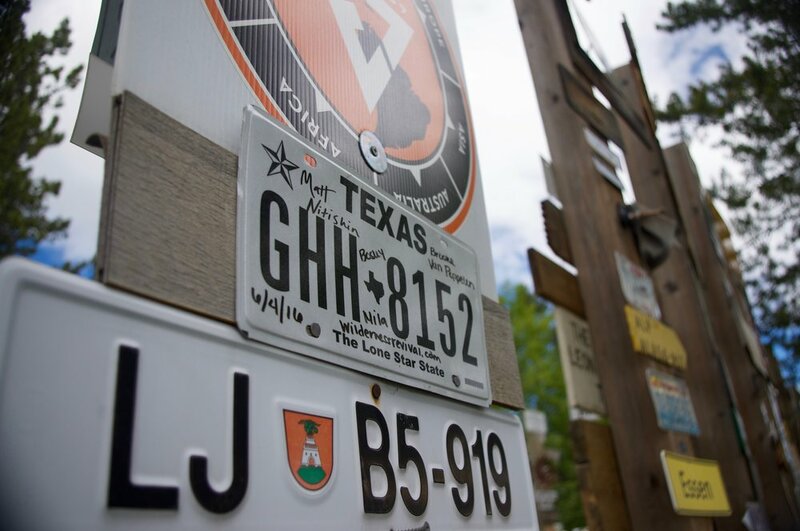 Lucky for us, I had an extra license plate that we had no use for, so we had to leave our mark in this vast sea of signs. The wonderful people who work at and maintain this amazing monument gave us nails, a hammer and a Sharpie for us to design and hang our plate. It was a unique experience and hopefully we will return one day to show our grandpups where we hung our plate. As we continued south, we made a return visit to the Liard Hot Springs for one last dip in the sulphur puddles, then continued on toward Prince George. Being older and wiser than we were the first time we visited Treasure Cove, we walked into the casino with a strategy. Needless to say, we took that video roulette game for all it’s worth and spent our winnings on Tim Horton’s breakfast and several campgrounds. This portion of the road trip is something I will never forget, and I hope to make the trek again in the future, maybe in an RV (or at least a Westfalia).